Pakalert Press » Why Do We Allow Ukraine’s Government to Write the Official Report on The Downing of MH17? 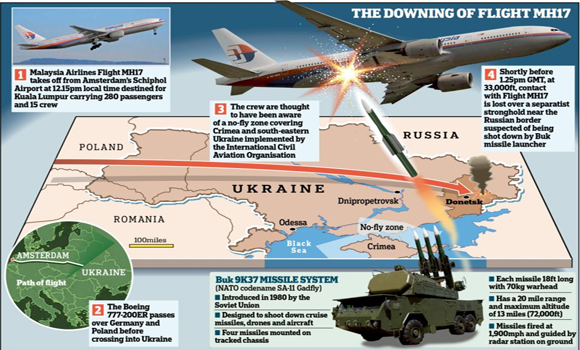 Why Do We Allow Ukraine’s Government to Write the Official Report on The Downing of MH17? There are only two suspects in the shoot-down of the MH17 Malaysian airliner over Ukraine on July 17th: the separatist rebels, whom the Ukrainian Government charge had shot it down mistaking it for one of the Ukrainian Air Force bombers that routinely drop bombs onto the separatists and their families and indiscriminately onto everyone else in that region; or otherwise the Ukrainian Air Force itself, as a means for President Obama to be able to win increased international sanctions against Russia for Russia’s support of those blamed rebels. One of these two suspects, the Ukrainian Government, was granted by the other three member-states of the official MH17 ‘investigating’ commission, a veto-power over anything that’s written into that ‘investigating’ report. This fact, of a Ukrainian veto, was made public on August 12th, in an obscure Ukrainian announcement. Then, on August 23rd, the first English-language news report on it was published at Global Research. The very next day, the present writer published a news-report placing that secret agreement into a fuller context. And, on November 20th, Russian Television reported that the four-member ‘investigating’ team are still refusing to say anything about the earlier news reports that the Ukrainian Government possesses this veto-power. Do Western Governments, and their now (in the wake of Obama’s coup) client-state of Ukraine, really think that the public are so stupid as not to recognize that this is an admission by the West (i.e., by the U.S. President and his various international stooges) that Russia was framed by themselves and their colleague U.S. client-states, into those economic sanctions? That’s the basic question, now, isn’t it? How many ‘reporters’ in the Western ‘news’ media are asking it? Why do their bosses refuse to allow them to ask it? Here is why: If ‘journalists’ don’t report it, then who’s to blame, for the public’s not knowing it, isn’t really their respective public (as any elite likes to claim: “Democracy is really just mobocracy”), but is instead those ‘news’ media themselves, for hiding this important information from them. So: that’s what the ‘news’-elite wants — an ignorant or misinformed public, a public that can be led around by the nose, like animals to their slaughter. Western diplomacy has become a scam, basically. Russia faces economic sanctions for what Obama did. And that’s the news that none of the Western ‘news’ media will report. This cover-up of that scam is, itself, very big news. How will Western ‘news’ media cover it? Or will they instead cover-up the cover-up; and, to the extent that they report about it at all, will they charge that the authentic news-reports about the matter, such as this one, are ‘mere opinion pieces, not really news-stories at all,’ and so simply ignore the solidly documented facts that are reported in these news-stories? However, is it really fair to expect the public to form truth-based opinions about things of which they are intentionally being kept ignorant, and even outright deceived (such as whether the sanctions against Russia are based on what they were told they were)? Is the problem really democracy, as so many executives in the ‘news’ business say? Or is it actually oligarchy itself: that this ‘democracy’ is merely fake? Will the Western ‘news’ media please, just for once, stand up and answer that? Or will they instead merely ignore it, as they ignore other vital truths? How much longer can the public accept being raped by the press, and by their allegedly ‘democratic’ government? How much longer will they, in fact, accept it? But how can they not accept it, if they are being constantly lied-to? Is that what the Western press will continue to do? Big news can have big consequences. But not so long as it’s still being kept secret, and lied-about. Like this. But wasn’t Hitler supposed to have lost World War II? And weren’t we his enemies? So, why is today’s U.S. President leading this restoration of nazism — of racist fascism — only this time against ethnic Russians? In fact, why does NATO itself even still exist, after the Cold War against communism was won? What are we fighting for now? What are we fighting against? Why are we fighting at all, so constantly at war? Who benefits from this? Why do we allow it? Perhaps, when a nation’s press is like this, controlled by oligarchs, the political drift towards and into fascism is inevitable. A ‘democratic’ fascism results if the public are deceived by an oligarchy. Racist fascism becomes then the way to build a passionate reactive compliance among the public, so they’re devoted to destroying what the oligarchs want them to fight and kill, thus to grab for the oligarchs land and resources the oligarchs want to conquer. Such a reactive passion among the public produces for oligarchs cheap soldiers. It cuts oligarchs’ costs, and thereby increases oligarchs’ profits. The idea that the press is merely a passive component in the body-politic is false; maybe it’s actually an oligarchic fraud. But, in any case, a press like this doesn’t merely result from racist fascism; it produces racist fascism. And maybe that explains what is happening in our time. Maybe that’s it. Maybe this press doesn’t merely result from fascism; maybe it causes fascism. Maybe that’s why Hitler posthumously is winning the ideological war he waged against America’s President in his time, FDR. Maybe that’s how fascism is taking over America, at last. If this is the case, then the answer to our title-question is, of course, likewise clear. Because it happened in their country. There do I win a prize for answering one of the dumbest questions I have seen in a while?